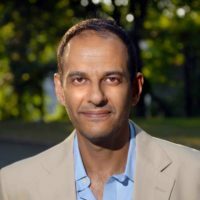 An accomplished journalist, Bayoumi is also a columnist for The Guardian, and his writing has appeared in The New York Times Magazine, New York Magazine, The National, CNN.com, The London Review of Books, The Nation, The Chronicle of Higher Education, The Progressive, and other places. His essay “Disco Inferno” was included in the collection Best Music Writing of 2006 (Da Capo). Bayoumi is also the co-editor of The Edward Said Reader (Vintage) and editor of Midnight on the Mavi Marmara: the Attack on the Gaza Freedom Flotilla and How It Changed the Course of the Israel/Palestine Conflict (O/R Books & Haymarket Books). With Lizzy Ratner, he also co-edited a special issue of The Nation magazine on Islamophobia (July 2–9, 2012). “Survival of the Physics.” Minza 18:1 (2017). “Dislodging the Stupidity of Our Politics: On Film, Representation, and the Muslim Travel Ban.” Walkerart.org. (July 5, 2017).